"Seaside allows you to be logged in to multiple Skype accounts simultaneously." Skype, the popular internet phone, chat, and video call application, has many different uses. With over 31 million registered users, I’m certain that not everyone is using it to make a video call with their cat in New Mexico. Skype is used for all kinds of activities such as work related calls with customers, video interviews for your next job, to sing happy birthday to your daughter who you’ve never missed a birthday, or meeting a new friend for the first time. Skype has even been featured on TV shows that interview their viewers from home or wherever they are. With so many different uses for Skype, many people are required to have multiple Skype accounts. Managing different uses under one Skype account can be quite difficult. Under one Skype account any information that you provide under the Skype name is available to all other users who have connected with you. While you can create groups and specify which people belong in which groups, it is still rather difficult to maintain so many people with different reasons for contacting you under one account. Certain settings cannot be customized the way that you would like them to be when you have only one account. Having multiple accounts gives users a bit more flexibility with Skype. Plus, you don’t want your personal account being mixed in with business. Speaking of business: many businesses require their employees to have a Skype account. While many employees already have a personal account registered with their personal email account, most businesses require that their employees register with their business account information and company email address in order to keep the separation between employees’ personal lives and business. While this has many pros, it also has some cons. One of those cons are evident when a user logs into Skype. Once logged in to either account, one should first take notice of something key; they have logged out of their other account. In Skype’s current version, users cannot login to multiple Skype accounts at the same time. This can pose a very big issue, especially if your main means of communication just so happen to be Skype, which is what the developers behind Skype strive to achieve. They want you to use Skype and no other internet calling application but a feature as small as multiple account login is not included. If you’re the average Skype user, you have two accounts: a personal account and an account for business related activities. If you’re the average Skype user, you also have the need to monitor both accounts for activity. It is very hard to monitor both account by shuffling back and forth, logging in and out of accounts. This is where Seaside comes in. 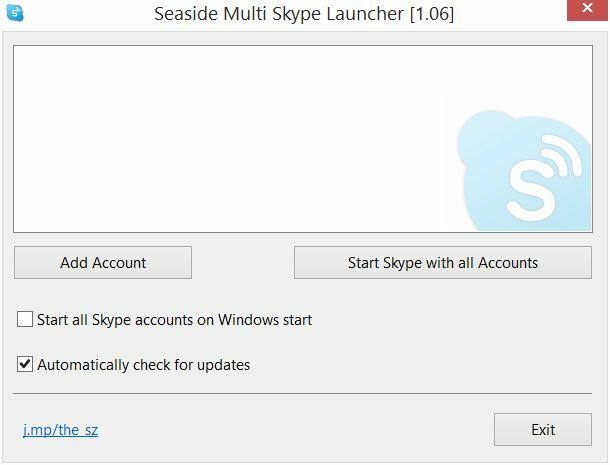 Seaside is an application that simply allows you to login, send, and receive chat messages, phone calls, and video calls to and from multiple Skype accounts simultaneously on your Windows PC. Seaside has a simple, one-window, easy to use interface that manages each account.